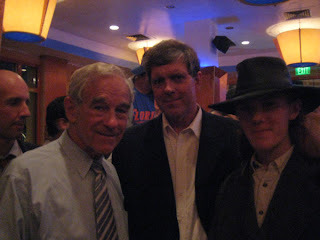 So below you will find a quite friendly looking picture of Ron Paul, Don Black, and Derek Black. Derek is Don's son, and Don Black is founder of the white nationalist neo-nazi web forum http://www.stormfront.org/. You'll find that the nazi's are quite fond of Ron Paul. I love that his last name is Black.